Speed is addictive, according to Lawless Alan, and his father can remember the exact moment his son got hooked. Even though his wife Dorian was not thrilled, Chris Alan had agreed to allow his son to try his hand at race car driving. Lawless Alan had expressed an interest in the sport after tagging along on some of his father’s races. Not knowing where his son’s curiosity would lead, Chris Alan started him out in go-karts. From go-karts, Lawless Alan moved to Legends car racing. Legends cars are 5/8-scale steel-bodied replicas of automobiles from the 1930s and 1940s, but with a motorcycle engine under the hood. They are cost-efficient cars raced by people of all ages, including a then 12-year old Lawless Alan. At Lawless Alan’s very first race, his father watched from his seat on the straightaway as drivers zoomed past. Noticing a man clocking the racers with a radar gun, Chris Alan wandered over. He asked him how fast the cars were going. Chris turned his head just in time to see a black car come flying by. “He’s doing 107,” the man said. The race didn’t end in victory for the first-time driver. Far from it. Lawless Alan seems to remember that either his motor blew up, or an oil line came off. Either way, he doesn’t think he finished the race. However, the race was a pivotal moment in Chris Alan’s eyes. It proved that his son, a mere fledgling in the sport, had potential. Lawless Alan possessed the unteachable trait. Flash forward to Sept. 22, 2018 at Irwindale Speedway in his home state of California. The potential that Chris Alan had noticed in his son seven years ago was being fulfilled. Lawless Alan wasn’t behind the wheel of a Legends car anymore. 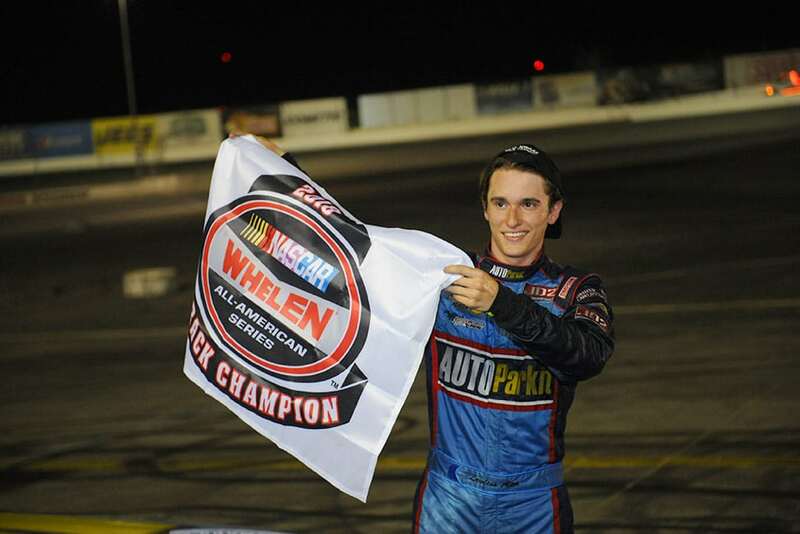 He had upgraded to a late model car, the highest level of race car, in 2017 and was now competing for the NASCAR Whelen All-American Series Track Championship. After reaching the podium 11 times, including seven first-place finishes, during the season, all Lawless Alan needed to clinch the championship was a ninth- or tenth-place finish. But in Lawless Alan’s mind, that was never the plan. Lawless Alan didn’t cross the finish line first, but he still secured a spot of the podium. With the championship in hand, champagne bottles were popped and celebration ensued. He enjoyed the victory he had worked so hard to secure over the course of more than 30 races. The revelry could only last one day, though. Lawless Alan had to catch a flight the next day back to Tuscaloosa, where he is a freshman at the University of Alabama. Chris Alan doesn’t know many professional race car drivers who moonlight as college students like his son does, but education comes first in the Alan household. When it was time for Lawless Alan to go off to college, there wasn’t any debate about putting it off to focus on his blossoming racing career. The only question that remained was where he would enroll. There was, of course, the idea of staying close to home. It had its benefits. The main one being that it would make Lawless Alan’s travel schedule significantly easier. However, Lawless Alan was enchanted with the South. It was where his mother had grown up, and it was the place that he usually spent several weeks in the summer visiting. Plus, like most 18-year olds, Lawless Alan wanted to get away from home. Alabama was a perfect match. “When he met with the folks from Alabama at a local college fair, he was like ‘That’s where I want to go,’” Dorian Alan said. It would’ve been considered love at first sight, except Lawless Alan’s mind was made up before he ever laid eyes on the green expanses of the quad or the football cathedral known as Bryant-Denny stadium. An ensuing visit to campus was only affirmation. Since being at Alabama, Lawless Alan has led a life similar to that of a varsity student-athlete. Well, sort of. Rather than traveling to competitions on a team bus, Lawless Alan has been commuting to races alone on early-morning flights. He doesn’t have scheduled practices. Instead, he’ll go to the gym with his fraternity brothers several times a week. Without actually being able to practice in his car while he’s in Tuscaloosa, he has taken to riding go-karts in Birmingham and simulating races with computer software. He’s especially fond of the latter method. The software is more than just a practice tool for Lawless Alan. It allows him to quench his desire for pushing the limits of speed, just without the real-life threat of a gnarly, potentially devastating wreck. On top of his responsibilities as a professional racecar driver, Lawless Alan has to maintain his schoolwork. He’ll squeeze in study time on the road. Late nights are not uncommon. Still, the grind of sustaining racing and school hasn’t worn him down. When asked about how he manages two very different lives, Lawless Alan will respond, but it’s clear he’d rather talk about something else. Perhaps the game of bowling he narrowly lost a few weeks ago, or an upcoming bet he has with a fraternity brother that he can beat him in a go-kart race. It’s in these conversations, about seemingly trivial contests, where Lawless Alan’s competitive streak shines. His eyes come alive in these moments. A playful smirk slides onto his face. It took him three days to get over a bad second round of bowling. It’s taken him much longer to get over losses on the racetrack. Whether school eventually interferes with those aspirations, that’s a problem for another day. In the meantime, nothing will slow Lawless Alan down. After all, there’s something about speed that he just can’t quit.